In 2011, we put in an asparagus bed, and for two springs we have patiently watched and tended, waiting for our first harvest. Last year we let the plants grow full and fern out, knowing this would be the year we would finally get to eat. The spears started popping last week, and I’ll say it was worth the wait. There’s just nothing like snapping asparagus spears in the garden, then walking into the kitchen straight to prep. Some of the spears are pencil-thin, which are perfect as is, and others are thick, which I use for soups and purees. Harvesting asparagus is simple, just snap it off with your hand when it reaches 7 to 8 inches tall. The tips should be tightly enclosed and not loosening, or “ferning out.” If the stem has shot up fast, you’ll have some left at the bottom after harvest, just cut it off at the ground line because they will dry out and get really tough to cut later. In the photo above, the three stems on the left got very tall overnight, and I only used the top 7 or 8 inches where it’s the most tender. Anything lower than that is pretty tough and woody. The two spears on the right will be ready in a day or two, and if we are lucky we’ll have asparagus coming for the next 4 to 6 weeks. Asparagus is a long-lived plant, and if we take good care of our asparagus bed it could last up to 15 years. I say that’s a pretty good payoff for a relatively small amount of work. Blend 1 cup of the thick asparagus slices and 1 cup broth until smooth. Combine the puree, remaining 2 cups broth, and 1-1/2 cups water in the medium saucepan and bring to a simmer. Keep warm over low heat, and do not boil. Melt the butter in the large heavy saucepan over medium heat. Add chopped onion to pan and cook until tender, stirring occasionally, about 8 minutes. Stir in the Arborio rice and cook 1 minute, stirring constantly. Stir in the wine and cook 2 minutes or until liquid is nearly absorbed, stirring constantly. Ladle in 1/2 cup of the puree mixture and cook 2 minutes or until the liquid is nearly absorbed, stirring constantly. Repeat with the remaining puree mixture, 1/2 cup at a time, stirring constantly until each portion of broth is absorbed before adding the next (about 30 minutes total). Stir in the remaining asparagus and cook until warm, about 2 minutes. Remove from heat and stir in 3/4 cup cheese, half & half, salt, and pepper. Serve garnished with the remaining cheese. 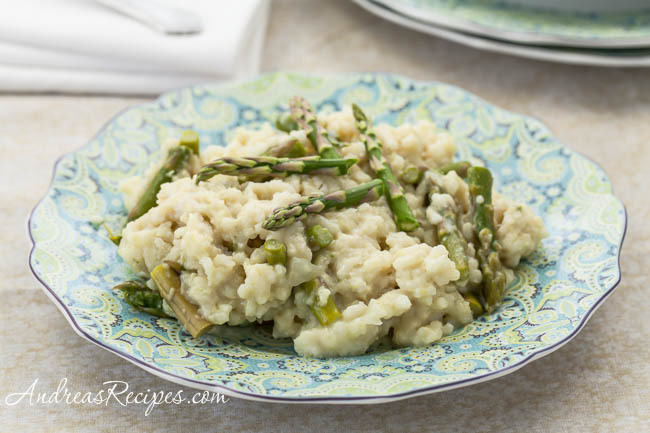 Asparagus flavor is infused throughout this risotto recipe from Cooking Light. Use the thicker ends to make the puree, and save the thin tender stems and tips for stirring in at the end. 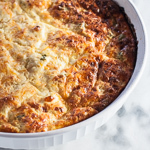 This recipe makes a large batch and will serve 6 to 8 people as a side dish, so you can easily halve the recipe for 4 people. I’m completely green with envy at your home-grown asparagus! I wish I’d put in a bed years ago. 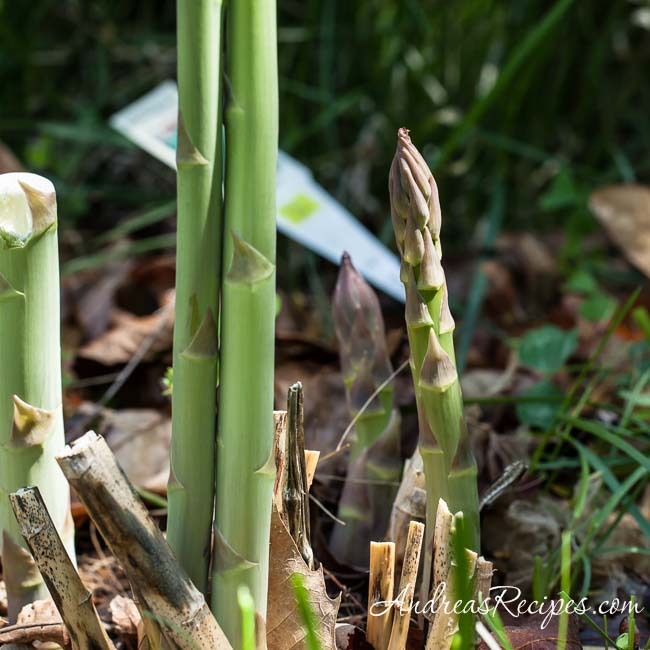 Andrea, I love that you are growing asparagus. 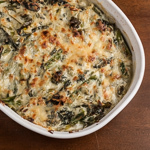 I have very fond memories of my great-aunt Adell growing asparagus at the family ranch. I use to pick it with her – I was probably 6 or 7. I can still visualize the wonderful experience. I wish we had the space to try to grow it – maybe someday, or maybe I should go visit the ranch. I am sure my cousin is still growing it!! 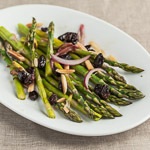 Oh, it makes me want to grow our own asparagus! I’m so impatient though, better get on it!